Whether you are managing your own Google AdWords account for your funeral home or cremation business or wondering if the company that you hired is doing the best job for you that they can, here are 10 tips that can get you the best bang for your buck. Make these improvements yourself or make sure that your AdWords consultants are applying these strategies to your account. 39:56 What happens if you see somebody in your area, and there’s no way that they’re trying to compete with you. Do we let that go, or should we be concerned about it? Robin Heppell: [00:00] On today’s show, we’re going to be talking about 10 ways funeral homes and cremation providers can save money with their Google AdWords campaign and get more clicks in the process. Announcer: [00:10] Welcome to “Strategy Talks” by Funeral Results Marketing where funeral professionals discover the latest marketing strategies that get results. Now join Robin Heppell and Brian Young as they share their insights and experiences to help you and your firm during these ever changing times in the funeral profession. Brian: [00:27] Welcome to another episode of the Strategy Talks by Funeral Results Marketing. 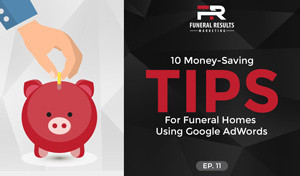 Before we get into today’s topic, I wanted to let you know that at the end of the show, if you stick around, you can get your own copy of the 10 Point Checklist for Funeral Homes using Google AdWords. [00:42] Over the years, we’ve seen a lot of funeral homes out there spend a lot of money on AdWords and in too many cases in looking back over the numbers, we see a lot of wasted money on AdWords. [01:02] Today, our own specialist here, Robin Heppell, who you guys know for many years, has been teaching funeral homes and cremation businesses, how to save money and get more with their marketing. He’s going to be talking about that with us. [01:15] Rob, where do you want to start today? Where should a funeral home or cremation provider start the whole thinking process, the preparation process? What should they do if they get in into having an online Google AdWords campaign? Robin Heppell: [01:31] One of the key things is when you get started on how you get setup, and one thing you don’t want to do is you put in a couple of keywords and then they’ll try to create the campaigns and ad groups for you. [01:49] On the other hand, usually if a funeral home or cremation provider is creating it themselves, they may end up lumping everything. Number one is we want to make sure is that we separate our keywords into specific ad groups. [02:06] The four main ad groups that I focus on are funeral homes, funeral cost, cremations services, and cremation cost. When we’re talking funeral homes, that would include funeral homes, funeral services, mortuaries, funeral parlors, when people are looking for a category of business. [02:30] Also, I would like to focus on the plural funeral homes versus funeral homes singular. When we dig into it, funeral home singular usually is preceded with the distinctive name of the funeral home. [02:53] From searching for funeral homes in Victoria, BC, they may search for Heppell Funeral Home, singular Victoria, BC. We still bid on the singular one but we want we’d be excluding our name and our competitor’s name. We’ll get into that in one of the other tips. [03:16] What we want to do, though, is then separate and have a different ad group for buying intent words, so when they’re using like costs or prices, the average cost, things like that where they’re being a bit more specific. The term that Google uses here is ad group. [03:39] When we’re looking at our hierarchy, we have our campaigns and then inside our campaign, we have our different ad groups. We group our keywords into these ad groups because we want to show a specific ad for those keywords. [03:57] If someone is searching for funeral cost, we want that ad to be more focused on funeral cost and then we want to drive them to a page about funeral cost. We have cremation services. That would be somewhere to the funeral homes example, and then cremation cost. [04:18] I’d also like to put these into two different campaigns. We have our funeral campaign with the ad group funeral homes and the ad group funeral cost, and our cremation campaign would have cremation services and cremation cost. [04:53] If they’re typing in cremation cost and you’re a funeral home that provides cremation services, if you add a generic ad that triggered that and talked about your funeral home services and maybe cremation, and that add dropped them on the home page that is not what Google calls keeping the cent. [05:16] You want congruence in your ad. If they’re searching for cremation cost, it’s best to have an ad that talks about cremation cost, and then it’s best to have a landing page that talks about cremation cost. That’s keeping the cent. [05:33] That’s very congruent versus they search for cremation costs, and all of a sudden, they end up on the home page of the funeral home website and then they have to start their search again from the home page. [05:49] Now, the reason why this will save you money is that for your different ad groups, your click through rate is going to go up because the ads are more tailored to the searches. Your ads are going to be more attractive and Google rewards this. 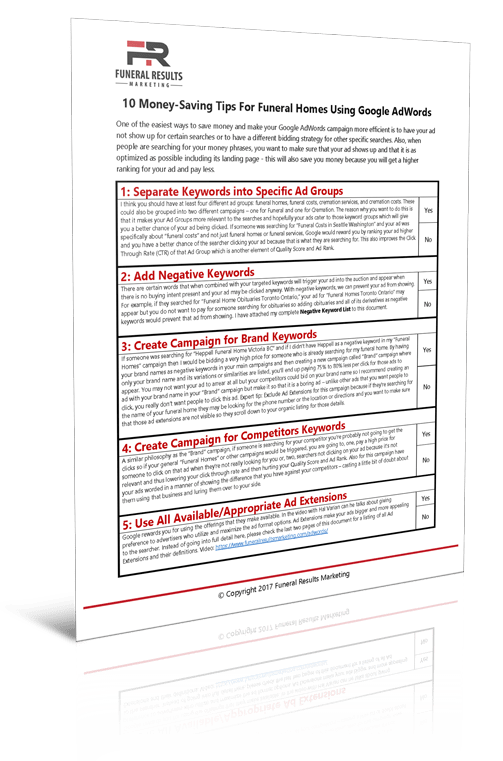 [06:07] If you have a higher click through rate, and if you have a better quality score meaning the landing page that you have associated to the keywords is really relevant, they’re going to give you a higher quality score. You might be paying less per click than your competitor even though your ad’s placed higher. [06:33] This is both a money saving tip as well as improving the ad rank for your ads and your campaigns. [06:46] That’s it in a nutshell. Make sure you separate your keywords into at least these four sets of ad groups. A little bit later, we’ll talk about a couple, especially campaigns too. We’ll wrap that one up for now, Brian. Brian: [07:00] That’s some pretty intensive material right there, Rob, for sure. I hope the listeners have their notebooks out. Don’t want to scam away, but this is good stuff. [07:11] After that basic negative foundation, what’s the next piece we need to think about? I know you talked about negative keywords, how does that play into this overall creator Google AdWord strategy in saving money? Robin: [07:24] One of the things is you do not want your ads to show up for certain searches for two reasons. One, you don’t want your ad clicked when people don’t really have the intent. Maybe you have a really curious, a well written ad but from what people have typed in, they’re not going to be a client, so you don’t want them to click on your ad. [07:54] You don’t even want your ad to show up because if your ad showing up for irrelevant search and they don’t click on it, then your click through rates is going to go down. That’s going to hurt your ad ranking quality score. [08:11] As an example, if you didn’t have any negative keywords and you’re bidding on the term funeral home Chicago, Illinois and that’s going to be pretty expensive ad, but the person who searched for a funeral home obituaries Chicago, Illinois that’s going to trigger your ad to appear, but they’re just looking for an obituary. [08:44] You’d want to make sure that a word like obituary and all of its derivatives are negative keywords. [08:56] We have a complete list of keywords that we add in. You can add them in at the campaign level or just overall as well. [09:09] We’ve got things like accidents bouquets or anything to do with flowers, carbs. You want to include, especially for your cremation campaign, like cats, dogs, horses, pets, obituaries as I mentioned, death notices, employees, employer, careers. These, you want to trigger your negative keyword list to prevent your ad from showing. [09:46] If people are looking for this, this is fine if they come across you, but these aren’t going to be making you direct money. Unless for some reason, you’re in a really big market and lots of people are searching for jobs. You might then have a specific campaign about careers. [10:04] We’d also include memorial folders, lawsuits, different things like that that you don’t want someone who’s doing research for something other than choosing a funeral home to do business with. [10:24] We have a complete list that we’re actually going to attach the keyword list to the checklist that you’ll get at the end. I just want to really stress the importance of having negative keywords and which will probably lead us into our next one, Brian. Brian: [10:48] Yeah, it does. I’ve seen that negative keyword issue and this next piece, I’ll have you explain to us two of the biggest problems. [10:58] What about when somebody wants to put their brand name in keywords? There are a lot of times when I’m on Google, and maybe I’m searching for electronics and I’ll see something like a Blockbuster or Target or Macy’s. [11:13] Is that a good idea for the funeral home in this queue or it’s a lot smaller situation? You don’t have thousands and thousands of shoppers here. What about using your brand name in the keywords? Robin: [11:27] I think it’s important to do this for a couple of reasons. The strategy that I recommend is creating a new campaign for your brand. We don’t want someone searching for Heppell Funeral Home Victoria, BC to trigger your main funeral homes Victoria, BC ad because if someone is searching for your distinctive name, they’re looking at that for a reason. [12:02] This is a two step process. We create our brand campaign but then in every other campaign, we add our surname or our brand names as negative keywords in all those other campaigns. [12:17] We want if anyone is searching for Heppell Funeral Home, Heppell Cremation services, Heppell Mortuary, whatever it could be, we want our brand campaign to be triggered and not the funeral home’s campaign to be triggered. [12:33] This is going to do a couple of things. One, since your website is going to be all about your name, you’re going to have probably a 10 out 10 quality score. [12:46] We see that when we do this, someone who’s paying $5 a click for funeral homes in Cleveland, Ohio, if someone is searching for a funeral home name in Cleveland, Ohio and that’s in a separate campaign, they might go from paying $5 for that generic search down to $1 or less, even like 50 cents. [13:16] That’s who they’re looking for anyway. Your competitors can search on your name or bid on your name, but if someone’s looking for the name of your funeral home and they see a competitor ad, they’re going to really need to cease, a reason why they would want to click it. [13:33] Plus, it’s going to be a really low quality score because it’s not getting clicked a lot. [13:38] Now, what’s important, though, we want to be really strategic here. If someone is searching for the name of your funeral home, we’d rather then just search or click on the…Put your Google on my business page, that’s probably going to pop up, or your top organic listing. [laughs] [13:57] My expert tip here is, make it a doll ad. You don’t want the ad to be super compelling. You just want it to be almost like a little bit of a business card so that it’s there. If you didn’t have it there, your competitors could be in that top spot and again, casting a little bit of doubt, so we have it. [14:18] We want to make sure that we don’t include any ad extensions, which we’ll talk about in one of the other points. [14:28] You want your ad to show up, but you want it to be plain, you don’t want it to be super compelling because if they’re searching for your name, maybe they’re searching for your phone number, or the obituaries, or the directions to the funeral home. [14:44] We’d rather not pay the 50 cents to $1, but we’d much rather not pay $5 for not going through this process of having a set of brand campaigns within negative keywords for your brand in every other campaign. Brian: [15:06] Now, you got me curious. The competitor in me is thinking. Well, you just mention maybe a competitor competing for your name, what do you think about putting competitors’ names in my keywords? [15:18] What if I want to show up if somebody searches for ABC Funeral Home, I want them to find Heppell Funeral Home. What do you think about that and how should I do it? Robin: [15:28] It’s the exact same strategy but just reversed. If someone is searching for our competitor’s name and we’re going to have some great ads, we don’t want someone to click our ad out of curiosity when it’s in our main funeral home’s campaign. [15:50] We take our competitors, we create a competitor campaign. We then take all our competitors’ names and their similarities or derivatives, and add those as negative keywords in every other campaign. In our specific campaign for competitors, that’s where we bid on their names. [16:11] In that campaign, we want to have a different set of ads where you’re really casting some doubt. Now, you’re probably not going to have high click throughs here. This is more of a defensive measure of not spending money. [16:28] You can also have a little bit of chance, especially maybe if someone’s a lot more expensive, you could have an ad that says, “Oh, if you’re searching not all funeral homes in Seattle charge the same, click here for a cost comparison on funerals.” Something like that, that would maybe cast a bit of doubt. [16:53] Now, you’re not going to get a lot of business out of that. You might get something. Again, it’s more we’re protecting your main campaign, because if someone is searching for your competitor’s keyword, they’re probably not going to click on your ads. That means your click through rates is going to go down. [17:14] I’ve been saying the same number of things similarly. We’re protecting our click through rate. We are wanting to keep our ad rank and our quality score high. [17:27] Again, this is a way to protect our click through rate and the very side benefit of maybe trying to change someone’s mind. It’s probably not going to happen, but it’s much better to have this off to the side in their own little campaign than eroding the click through rate of your main campaign. Brian: [17:50] We’ve got a couple of other points here to move through here. One thing I want to ask you real quick before I move on, you’re describing a scenario that we’re playing defensive. We’re protecting our space. I know we’ve talked about this movement from computers and laptops to more and more families using smartphones. [18:14] A lot of times now, when people are on a smartphone, you can only see two or three listings. Would you say that due to the smartphone era, that the AdWords part of the game is even more important now, or is it about the same as it was before? [18:28] I’m looking at the screen. I can’t see that many results. Robin: [18:32] Yeah. It is more important now than it has been in the past with, I think, in almost every market that we have clients in. The overall traffic to their websites has cracked that 50 percent mobile. In our bid strategy, again, I would want to bid high on your funeral homes, or in cremation services, cremation cost, funeral cost. [19:08] You want to be in the top two spots on mobile. You can actually go in and adjust your bid. Maybe for some reason, you have a couple of competitors in your market that really spend a lot of money in AdWords, and they are always in the top two spots, and maybe you’re in the third spot because you don’t want to spend a lot more. [19:36] It’s really important to maybe then do a bid adjustment to get your ad in the top one or two for the mobile. You can do what they call a mobile bid adjustment to move your ad up. [19:50] Again, I won’t worry about that for the competitor’s search, and maybe even just for your competitor campaign, don’t even lower your bids on mobile because if someone’s searching from the phone for your competitor, you’re probably not going to change their mind from a phone. You may not want your ads to show at all. [20:13] If they’re searching for your name, then they’re probably going to see your organic listing pretty quickly, even if your ad’s not showing. Your ad’s probably going to show anyway because you’re going to have such a high quality score even though you’re bidding a lot less. [20:35] Hopefully, Brian, that answers your question of a slightly little…Maybe that’s a topic for another podcast, where we really get into mobile bidding and the differences there. [20:49] I always picture the person sitting at the side of the bed at a hospice when their loved one’s dying, and they’re starting to do their research right there. How do you appear in that circumstance? Brian: [21:08] That’s interesting thoughts, good topic for the future. I look forward to that. I’ve got another question for you here that relates to our next point. [21:35] What are those called, and what can you tell us about those? [21:57] They’ve had this for a while now. They’ve had some ad extensions like sitelinks where you might see three or four separate link like words or phrases linked below the ad. [22:16] You might see a phone number. That’s the phone extension or the call extension. You might see the location with the little balloon. That’s the location extension. They keep on adding these. [22:33] There’s another one called the callout. It’s not clickable, but it’s something that you can add a couple of things such as Satisfaction Guarantee, No Hidden Fee Guarantee, 24 hour Service. [22:48] The more that you use these, Google appreciates that. One of the factors in their formula of Ad Rank is how much ad format are you using. If you don’t do this, then Google is going to say, “Hey, these guys aren’t really that serious.” If you activate these now, just because you have all your ad extensions activated doesn’t mean that they’re going to show. [23:17] They’re going to show for the top spots. You’re going to see a lot of them, but not all of them. Once you get into third spot, fourth spot, you don’t see as many ad extensions as you would in spot number one and two. [23:35] There is also ones that are called the structured snippet, which you can take a topic, so you could say amenities, reception center, funeral chapel, audio and video displays, convenient parking. These are things that are giving you, you can say, a little bit more about your facility or about your operation. [24:03] One of the newest ones is the price extension. This is really good, especially for cremation operators or low cost cremation operators where you can actually have your simple cremation, your celebration of…maybe you’ve got your cremation only, simple cremation, and then signature cremation prices. [24:57] Not only does it make your ad more appealing, it actually pushes everyone else down further down below you because it’s giving you way more real estate, and you can address different things that people might be thinking of. [25:13] If they’re looking for cremation offerings, or options, or prices, or comparison, you can have different lengths to those different items, again, as long as it’s in the same frame of search that they’re looking for. [25:34] One last extension is the review extension. If you have reviews, you can have actually a review show up in your ad as well. Again, these really only get displayed for the people who are in the first position and the second position. [25:50] Putting all these ad extensions into play are going to help you move up that in Ad Rank so that you might…as long as you’re bidding well, and as long as everything else is done well, you’re going to be in those top one or two spots. Brian: [26:08] That’s really getting into the finer skills of operating an AdWords campaign, I think. That makes sense, which you explained there. [26:19] I know there’s a couple of other pieces that are important to the successful function of an AdWords campaign. You mentioned to me something about landing pages. How do landing pages figure into an AdWords campaign? For those who don’t know, maybe just real quick, could you refresh our memories of what a landing page actually is? Robin: [26:37] We did mention this in the first step. A landing page is the page that the visitor or the searcher lands on after they click your ad. We want that landing page to be relevant to the search. Again, we want that to be a congruent process, again keeping the sentence Google says. [27:02] If they’re searching for cremation cost, you want to show an ad that talks about cremation costs, and then you want them to land on a page that talks about cremation costs. That is congruent. [27:17] Also, Google will give you a higher quality score because that landing page is associated with the search. [27:29] If they search for cremation costs, and you put them onto your home page of the funeral home where they talk about funerals, and cremations, and directions, and obits and all that stuff, cremation gets really watered down there. [27:42] You probably don’t have cremation costs on your home page. It’s not going to have the same quality score. It’s not going to give what is most important to Google. It’s not going to give their person the best user experience because they’d have to then start searching from your home page and find cremation, and then find cost if they happen to have that. [28:09] That’s it in a nutshell. We’ve talked about it already. That’s another way to lower your cost because if you have a higher quality score, you’re going to have an overall higher ad rank, and you could be bidding less than the next person and still have the top spot. Brian: [28:27] That makes a lot of sense. Here’s a transition there. I know people come to us looking for help, and I’ve heard over the years, we’ll work with a company, they’ll track themselves, and they’ll “set it and forget it” when it comes to their Google AdWords, or the company they’re working with will. [28:51] Is that a safe procedure, or is there things you need to continually do? How would you respond to that? Robin: [28:59] I think this is what we’re going to be talking about here, is what we call keyword pruning. There’s all this other stuff that is out there that you can see, these things that we’ve talked about, about [inaudible] ad extensions and that. [29:19] Keyword pruning is really important, but it’s tedious work. I think this is the one thing that we do this all the time. We’re in there depending on the type of package you have every week or every other week, going through and looking at the actual searches that people are making to trigger your ads. [29:41] If we see something, because there’s going to be weird anomalies, and we don’t want your ad showing for irrelevant searches. [29:53] As an example, even right here in Victoria, our client, McCall Gardens and Funeral Cremation Services, early on when we started their campaign, we started seeing that people because you’re not bidding on these keywords, so you won’t know unless you dig into the actual search terms. People were bidding on McCall’s and recipes, and McCall’s and dress patterns. [30:23] Some people might know that there’s a ladies’ magazine called “McCall’s.” They have a homemaker’s magazine and has all this information about that stuff. Their ad was getting triggered for these things. This was even before we had separated their name to their brand account. [30:46] What we did though is we go, “Hey, we don’t want these ads showing up.” Anything if someone was searching for McCall’s and apple pie recipe, the ad wouldn’t show at all. [30:58] We don’t even want it to show up because if it did and they didn’t click on it, it’s going to hurt your click through rate. If they did click on it for some reason, it’s going to cost you a click. [31:10] It’s really important, but again it’s tedious. Usually, the funeral director isn’t going to go in and do this on a regular basis. It saves the funeral home money because we’re in there. We’re getting rid of irrelevant clicks, and we’re also increasing the click through rate of not having the ad show up for irrelevant searches. Brian: [31:40] That probably explains why so many of our clients, people who are clients today or people we’ve talked to said that their previous AdWords provider set it and forget it as far as they could tell because it is so tedious. [31:54] Let’s transition a little bit. Along that line of how do we continually improve our Google AdWords campaign so we’re getting better return on investment, better ROI, what things can we do to improve the quality score? You’ve already talked about that. You’ve talked about keywords. [32:10] What should we watch for? What can we do to improve the quality score of our keywords and our ad campaign? Robin: [32:18] Now that we’ve got everything set up, there’s going to be keywords that are better that are probably going to be the more obvious ones, like funeral homes in, funeral homes and then your city and state or province. [32:40] Sometimes the word in is in there, or sometimes it’s not. Those are the real money searches. You want to look at those, make sure that your quality score is at least a six or higher for those, and not just for funeral homes, but then your next set would be funeral costs, funeral prices, and see what your quality score is there. [33:11] Again, if it drops, if it’s five or below, or even six, you may want to either see what landing page it’s going to. If it’s going to your home page or going about your services, it might be worthwhile to create a new landing page that talks more specifically about that. [33:30] You’re going to see which searches are the most popular, and then really hone those to improve that quality score, which is going to then improve your ad rank which is going to actually lower your cost per bid and, at the same time, allow you to have your ad placed as high as possible. [33:57] Again, this is more of a maintenance ongoing. You want to be looking at those main ones. The one thing that we’re not talking about is the human that’s actually going there. If they searched on cremation costs and they land on the funeral home home page, they’re going to be frustrated. [34:20] It’s like when you’re phoning customer service anywhere and you start going down the path, and then you get routed back to the head operator. “OK, let me…Sorry, you’re at a switchboard again.” You want to go through. [34:35] Putting them on your home page is like putting people back at the switchboard. They’re not going to have as great an experience either. The human element, they’re going to be frustrated. [35:02] Also, what if they’re searching, looking at their own ads all the time? Do any of those behaviors hurt or help you, or hurt or help your competitor? Robin: [35:10] It’s funny because we’ll get this often. The first thing we do is we tell people, “Look, don’t click on your ad.” I don’t know. Maybe things have been slow at the funeral home, and they’re sitting in front of the computer and their Google open. They’re starting to do different keyword searches. [35:31] One thing that’ll happen is, over time, if people keep searching and they don’t click on your ad, if they’re searching and they’re not going to click on their ad, maybe they’ll click on their competitor’s ad or maybe they’re checking out their organic listing or their local Google My Business listing. [36:28] More importantly, it’s best to use the Google AdWords Preview tool. This is a utility that Google offers that you can go to, and you can perform a search. The nice thing about this is you can actually put the city in of where you want the search to be as if where the search is being generated from. [36:51] If you’re in a big area, you may want to try a couple of different communities of, how does your ad show up in those different communities? We use this all the time because we’re not in the same town as our clients. We don’t see how the ads show up because if we search from here for someone else halfway across the country, the ads are probably going to show up differently anyway. [37:17] Using the Preview tool, it shows you exactly how the ads are showing up for that search from that city, and it doesn’t trigger an impression. Meaning, it’s not showing your ad, and then giving you a penalty of lowering your click through rate because the ad didn’t get clicked on. It’s static. [37:45] When you use this tool, you can’t click on the ads. It’s showing you basically a snapshot of that page. You can use this for organic to check out your organic listings as well because it gives you the pure search without any history or other preferences that may be set from your personal computer. [38:05] Also, when you’re talking about you’re competitor’s ad, as you mentioned, Brian, if you want to check out your competitor’s ad once in a while, that’s fine. Maybe click on that once. I’m not saying that you should do it all the time. [38:24] If you do it all the time, sure, you’re costing them some money, but you’re also improving their click through rate. [38:32] Again, if you want to do it once to see the path of what they’re doing, I guess that’s OK, but don’t do it repeatedly because if you do that repeatedly, sure, it’s costing them a little bit of money but it’s also improving their click through rate, at the exact same time you’re hurting your click through rate. [38:53] I recommend going to the Google Ad Preview tool, and checking to see how your ads are showing up from there. It’s simple. Go to Google, type in Google AdWords Preview tool, and it’ll take you right there. Brian: [39:07] It’d be funny to think of trying to knock your competitor down a notch or two, when actually you’re doing the reverse and helping their ad up. [39:17] You explained that on the Funeral Results Marketing website in some detail if people want to go there, look at the AdWords and see the explanation of how the scoring and the ad ranking works with relation to costs and how, as your score goes up, your costs actually go down. [39:34] I have one more question for you. I’ve seen a lot over the years. Suddenly, an ad will start appearing in a market from somebody who’s 50, 100, maybe 500 miles away. I’ve even seen, for a while there was, I think it was Affordable Cremations of New York, and I would see that ad all over the country for all kinds of searches. [39:56] What happens if you see somebody in your area, and there’s no way that they’re trying to compete with you? It’s not like they’re Neptune or some national company. Is there anything? Do we let that go, or should we be concerned about that? How might that impact us, and what should we do? Robin: [40:12] I wouldn’t say let it go. You have to go a little old school here. The best thing is to pick up the phone because a couple of things are happening here. We have a little bit of a theme of today’s presentation. [40:34] There’s actually the issue here with Neptune. In Victoria, BC, as the crow flies, we’re not that far away from Seattle. There’s a Neptune office there. [41:07] They’ll also say, “Well, what if someone is outside of this area searching for this area?” There’s these gray settings that you can set up. [41:19] When we get back to this example here with Neptune from Seattle, however they have their settings set up, whether it’s a radius or something, what they haven’t done is they haven’t excluded Victoria, BC. Again, as the crow flies, we are quite close to them. [41:43] There’s a large body of water between. There’s the Strait of Juan De Fuca between Washington State and Vancouver Island, and then all the mileage down to Seattle. People aren’t going to be coming across a big body of water like that into another country and perform a service. [42:36] Or they don’t click on the ad, and it then registers a decrease in their click through rate. The best thing to do, and that’s why I say go old school, pick up the phone. Talk to them nicely and say, “Hey, look, I know we’re both in the funeral profession. We’re here in a different area. We’re either…” and it depends on where you are. Maybe you’re in a different state, and the rules are a lot different. [43:03] Maybe you’re across a river, and there isn’t a bridge on either side for 10 miles or so. For some reason, because of their settings, the ads are showing up where they really can’t serve them. [43:19] Now you might get someone who’s being a jerk and says, “Hey, well, we’re going to take a call wherever we can get it.” I guess they don’t really care about their account. [43:33] If they do, you’d say, “Look, can you exclude…?” I’ll pretend this is…Brian, you’ll be the Neptune guy in Seattle, and I’ll be McCall’s Funeral Home here. [44:53] That’s going to, for your local business, you’re going to have one less competitor. The bids aren’t going to be as high. There’s going to be less confusion in the market. [45:04] Go a little old school. Pick up the phone. Try to work it out. If they’re smart marketers, they’ll thank you for it. If they’re being jerks, they’re probably just going to say whatever. Brian: [45:32] That is a lot to think about. Brian: [45:35] In fact, it’d be fair to say, if you were going to a community college, you’d pay a fair amount of money to learn all that. Hopefully, you’ll appreciate that. I know I do. [45:47] You had said there at the beginning that they can get their own copy of a 10 point checklist regarding these tips to help them. What do they need to do to get that, Rob? Robin: [45:57] Below the podcast episode here or go to funeralresults.com/11. Click on the button. You can download. It’s two pages, front and back, with each of one of these with a little bit of a description here so that you’re reminded of what we were talking about. [46:24] You can circle yes or no, or give it to your marketers who are looking after your campaign. If you think, “Hey, it sounds like you know way more about it than us,” we’d be more than happy to manage your account for you. [46:45] Again, for these things that we’re talking about, we implement these. They’re probably going to save you the cost of our monthly management fee anyway because we’re on top of it. This is what we do. [46:59] You’ve got better things to do. You’re in community making those connections, building a rapport, serving families. Let us focus on this, and actually save you money. [47:14] We do have a six month money back guarantee on our AdWords program where you can give us try. After six months, if you don’t like the results that you get, we will give you back any setup fee and management fee over the course of that six months. [47:35] We can’t refund the clicks from Google because you have gotten that business to your website, but everything that was billed to us, we will refund that. We’re pretty confident that we can help most funeral homes, especially in competing markets. [47:53] You can get more information at funeralresultsmarketing.com/AdWords on the programs that we offer. Brian: [47:58] I wanted to throw in there, Rob, after over 10 years in the industry, I’ve never seen anybody else who offers a money back guarantee, even partially, let alone 100 percent. That shows your confidence. Anybody who gets in there and digs around certainly sees how tedious it is. [48:20] With that, real quick before we end the show today, we wanted to remind everyone. This topic and more detail about it will get talked about in our upcoming Cremation Conference in September down in St. Petersburg, Florida. [48:32] If you want to know more about that, please go to the cremationconference.com. You can get more details, especially if you are a cremation operator or you want to compete more for cremation cost or service, dominating on search engines, even in the paid area, is very important. We’ll be talking more about that. [48:51] As usual, we’d like to finish by asking you, what’s your burning question about online marketing for your funeral home? If you will leave it here, we will try to answer it on an upcoming episode. [49:01] If you like what you’re hearing, please do leave a comment on the blog, or give it a rating on iTunes or Google Play. Robin: [49:08] Thanks for spending time with us today. It is our goal for you to serve more families and provide them more meaningful services. Make sure you check back soon for another episode of Strategy Talks by Funeral Results Marketing. [49:20] Until the next episode, this has been Brian Young and Robin Heppell. Announcer: [49:24] This has been another episode of Strategy Talks with Robin Heppell and Brian Young. To ask a question or leave a comment, visit funeralresultsmarketing.com/talks. [49:34] To make sure that you never miss an episode, you can subscribe to this podcast for free on iTunes, Google Play, and Stitcher.